Free Ground Shipping within the US. The Pilot USA PA-1181TP is a pink ladies aviation headset with audio in that features pink ear cups. 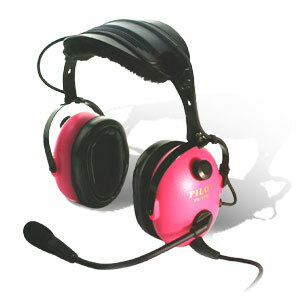 The Pilot USA PA 1181TP is an ladies pink aviation headset. The bright pink colored ear cups make this an exciting and popular choice. A fully flex “memory” microphone boom with an electret microphone allows the user to position the microphone and boom in the precise place they want it. A breathable sheepskin fleece head pad gives you the comfort you've been looking for. No more hotspots! A built-in PTT button is installed on the ear cup in case your portable PTT fails or the yoke mounted PTT is inoperative. This feature is also great for flight instructors. To make this headset stand out from the others, black chrome hardware is used to go along with the textured black ear cups to create a very sophisticated look in the cockpit. As with Pilot USA's top of the line ANR headsets, the PA-1181TP is fitted with twin layer gel silicone ear seals. This pink aviation headset is cell/satellite phone capable. This feature allows the user to listen to a CD player, IPOD®, MP3® player or external radio. You'll experience “True Stereo” for your listening enjoyment. In addition, it comes with a padded headset case. For more information, please feel free to review the Product Manual for the Pilot USA PA-1181 Headset. ASA's AirClassics Flight Bag Pro is designed with 1000D nylon, nonslip, detachable carry strap, and connectable comfort-grip handles. This Flight Bag PRO has the capacity and convenience for all pilot's flight necessities. For those who like to fly with minimum baggage, this headset bag holds one headset, has extra pockets and all around padding. The PilotComm Pink Ladies Aviation Headset in Light Pink comes with Cell Phone/MP3 Interface.